I am so used to modern conveniences, I have completely forgotten what it was like without them. 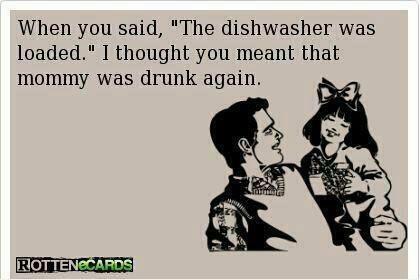 Take the dishwasher. I don’t really remember if I ever had an apartment without this time-saving, dirty-dish-hiding miracle of engineering, but I am pretty sure I did not. I think maybe in one of my cheesy college apartmentish dormish domiciles I might have had to tough it out by actually doing the dishes myself, but that was like 200 years ago. Anyway, as you might have guessed our dishwasher is out of order, and my daughter is also out of order, and she has had a lot of company to keep her company, which equals a lot of dishes, and guess who’s doing those cereal encrusted bowls, guacamole residued plates, and all the stacks of dirty pots and pans? Bingo, you win a dish towel, now please come over and dry. So, my husband called a company called One Day Service, which seemed like the smartest company to call when your dishwasher is not doing the dishes, right? You will have it fixed by the time you make dinner. BUT, when he called on Friday, One Day Service could not book our appointment until Monday. Um, I’m thinking they might want to change their name. I will never complain about emptying that damn dishwasher again. All hail to the Miele. I freaking cannot wait to get it back online. I’m going to go buy some paper plates right now.